I am currently a Work Package leader for a project funded by the EU FP7 programme. The project involves 11 partners from across Europe and focuses on the cascading effects that emerge from crisis situations. My two tasks will focus on the communication strategies adopted by incident managers and first responders, with a specific emphasis on how social media is deployed in such situations to provide accurate, real-time information to the public. I look forward to working with Xavier Criel and Safety Centre Europe on this project, which is due to finish in December 2015. Further information on the Leicester-based Research Associate who will assist me on the project will be published in a press release next month. CascEff is now on Twitter – please follow the official Twitter account for updates on the project. 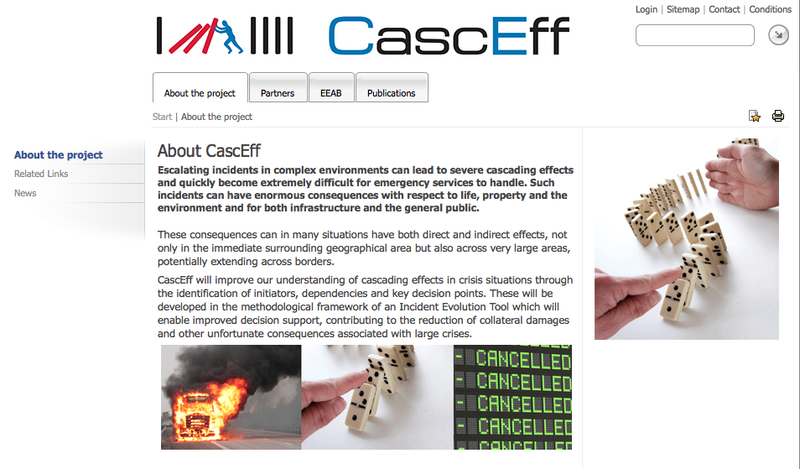 CascEff – “Modelling of dependencies and cascading effects for emergency management in crisis situations” is performed and funded under the Seventh Framework Programme (FP7) of the European Union (SEC-2013.4.1-2). This entry was posted in Uncategorized and tagged CascEff, crisis situations, Research Associate, social media by Paul Reilly. Bookmark the permalink.